Dry natural gas production in Mexico has fallen 38% since 2012 because of declining reserves, a low price environment, and limited exploration and production of new wells. Mexico’s dry natural gas production was 2.4 billion cubic feet per day (Bcf/d) in October 2018, according to Petróleos Mexicanos (PEMEX). This level is down 7% from year-ago levels, when production averaged 2.5 Bcf/d, and down 21% from two years ago, when production averaged 3.0 Bcf/d. President-elect Andrés Manuel López Obrador from the National Regeneration Movement, a Social Democratic party, is set to take office on December 1. One of his initiatives is to reevaluate Mexico’s current energy reforms, enacted in 2013 by the previous administration. 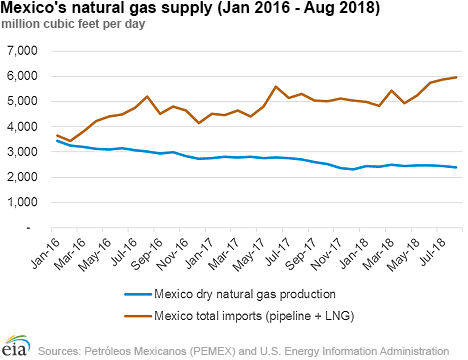 Because of declining production and increasing demand, Mexico has had to rely on natural gas imports—from the United States by pipelines and liquefied natural gas (LNG) shipments by vessel—to meet demand. EIA’s data show that for the month of August, U.S. natural gas pipeline exports to Mexico grew 13% from year-ago levels as a result of several new pipeline projects that have entered service. U.S. pipeline exports to Mexico were 5.1 Bcf/d in August 2018 compared with 4.5 Bcf/d in August 2017. They comprised an average of 60% of Mexico’s natural gas supplies in 2018 through August, compared with 58% for the entirety of 2017. LNG imports are generally more expensive than pipeline natural gas imports because of the infrastructure required to liquefy and re-gasify natural gas and the relatively high transportation costs associated with using specialized LNG vessels. The President-elect has denounced the high cost of LNG. LNG imports into Mexico are currently necessary to meet demand. The interior of Mexico relies primarily on LNG imports from the west coast’s Manzanillo terminal until domestic pipelines connecting to pipeline supplies from the United States are placed in service. More specifically, Wahalajara, the pipeline corridor connecting Permian natural gas from the Waha hub in western Texas to the population centers of Mexico City and Guadalajara, is currently scheduled to be in service in May 2019, according to S&P Global Platts. Before 2016, Mexico’s LNG imports averaged 0.7 Bcf/d annually and did not include any U.S LNG imports. Mexico began receiving U.S. LNG in August 2016 after the first liquefaction facility in the Lower 48 was placed in service earlier in the year. 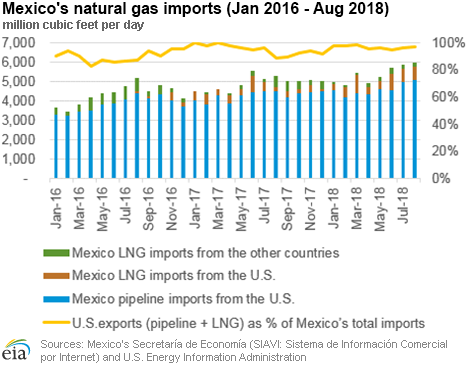 Since then, LNG imports from the United States have been growing and currently account for 77% of the total Mexican LNG imports as of August 2018, up from 63% in 2017, based on data from EIA and Mexico’s Secretaría de Economía. LNG imports in August 2018 totaled 0.86 Bcf/d, an increase compared with year-ago levels of 0.8 Bcf/d. To transition from LNG imports to increased natural gas via pipeline, Mexico has made US $10 billion in capital investments in its natural gas pipeline infrastructure. It added 2,883 miles of pipeline since 2013, expanding the system by 41%. However, most domestic pipelines under construction have faced long delays. For example, on November 19, TransCanada Corporation announced it had halted construction on the Tuxpan-Tula and Tula-Villa de Reyes pipelines. EIA’s Annual Energy Outlook projects U.S. pipeline exports to Mexico to average 4.7 Bcf/d in 2018, 5.5 Bcf/d in 2019, and 6.0 Bcf/d in 2020. Natural gas spot prices fell at most locations this report week (Wednesday, November 21 to Wednesday, November 28). Henry Hub spot prices fell from $4.68/MMBtu last Wednesday to $4.44/MMBtu yesterday. At the Nymex, the December 2018 contract rose during the report week, expiring yesterday at $4.72/MMBtu. The January 2019 contract price increased to $4.7/MMBtu, up 22¢/MMBtu during the report week. Net withdrawals from working gas totaled 59 billion cubic feet (Bcf) for the week ending November 23. Working natural gas stocks are 3,054 Bcf, which is 17% lower than the year-ago level and 19% lower than the five-year (2013–17) average for this week. The natural gas plant liquids composite price at Mont Belvieu, Texas, fell by 63¢/MMBtu, averaging $6.54/MMBtu for the week ending November 28. The price of natural gasoline, ethane, propane, butane, and isobutane all fell by 11%, 9%, 8%, 12%, and 7%, respectively. According to Baker Hughes, for the week ending Wednesday, November 21, the natural gas rig count remained flat at 194. The number of oil-directed rigs fell by 3 to 885. The total rig count decreased by 3, and it now stands at 1,079. The Henry Hub average spot price declines after four straight weeks of increases. During the past four report weeks, from Wednesday October 31 to Wednesday November 21, prices increased from $3.29/MMbtu to $4.68/MMbtu as most of the Lower 48 states experienced generally cooler weather. For the report week, Henry Hub prices fell by 24¢/MMBtu to $4.44/MMBtu despite cooler temperatures persisting across the East and Midwest. Northeast prices decline. At the Algonquin Citygate, which serves Boston-area consumers, prices dropped $3.04 from $9.02/MMBtu last Wednesday to $5.98/MMBtu yesterday. At the Transcontinental Pipeline Zone 6 trading point for New York City, prices decreased 54¢ from $5.07/MMBtu last Wednesday to $4.53/MMBtu yesterday. Tennessee Zone 4 Marcellus spot prices decreased 12¢ from $4.39/MMBtu last Wednesday to $4.27/MMBtu yesterday. Prices at Dominion South in southwest Pennsylvania fell 3¢ from $4.24/MMBtu last Wednesday to $4.21/MMBtu yesterday. Prices at Sumas on the Canada-Washington border increase. Following the Enbridge pipeline explosion in October, prices at Sumas on the Canada-Washington border have remained high. Prices rose $9.15 from $7.91/MMBtu last Wednesday to $17.06/MMBtu yesterday. U.S. imports from Canada at the border continued at about 0.5 billion cubic feet per day (Bcf/d) according to PointLogic data, or about half of their pre-explosion levels. Discount at Permian Basin trading hub reaches a new record. Prices at the Waha Hub in West Texas, which is located near Permian Basin production activities, averaged $1.29/MMBtu last Wednesday, $3.39/MMBtu lower than Henry Hub prices. Yesterday, prices at the Waha Hub averaged 46¢/MMBtu, $3.98/MMBtu lower than Henry Hub prices. Yesterday’s discount is the highest price difference between the Henry Hub and Permian for the year. California prices increase. Prices at PG&E Citygate in Northern California rose 54¢, up from $6.17/MMBtu last Wednesday to $6.71/MMBtu yesterday. As of November 16, according to PG&E, 16,000 PG&E customers remained without power and 12,000 customers remained without natural gas after the Camp Fire incident that started in Butte County on November 8. The fire was fully contained on November 25 according to the California Department of Forestry and Fire Protection. Prices at SoCal Citygate increased 11¢ from $7.23/MMBtu last Wednesday to $7.34/MMBtu yesterday. Nymex front month futures prices increase to their highest levels since 2014. At the Nymex, the December 2018 contract expired yesterday at $4.72/MMBtu, up 26¢/MMBtu from last Wednesday. The January 2019 contract increased to $4.70/MMBtu, up 22¢/MMBtu from last Wednesday to yesterday. This contract had the highest front-month contract price since February 2014, which was an unseasonably cold winter with low inventory levels. The price of the 12-month strip averaging January 2019 through December 2019 futures contracts climbed 12¢/MMBtu to $3.26/MMBtu. Supply increases slightly as both production and net Canadian imports rise. 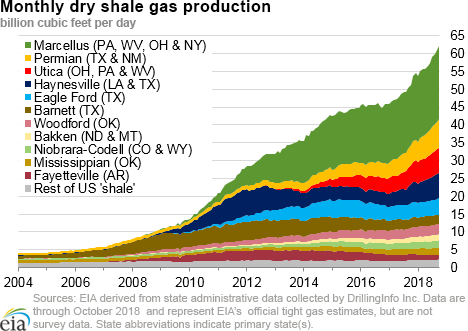 According to data from PointLogic Energy, the average total supply of natural gas rose by 1%, averaging 92.9 Bcf/d, compared with the previous report week. Dry natural gas production grew by 1%, averaging 88.5 Bcf/d, and average net imports from Canada increased by 1% from last week. Demand remains unchanged. Total U.S. consumption of natural gas was unchanged from the previous report week, averaging 84.2 Bcf/d, according to data from PointLogic Energy. Natural gas consumed for power generation declined by 4% week over week. Industrial sector consumption stayed constant, and consumption in the residential and commercial sectors increased by 4%. Natural gas exports to Mexico decreased 1%. U.S. LNG exports are flat week over week. Seven LNG vessels (six from the Sabine Pass liquefaction terminal and one from Cove Point) with a combined LNG-carrying capacity of 24.4 Bcf departed the United States from November 22 to November 28. One LNG tanker was loading at Sabine Pass on Wednesday, according to Bloomberg’s shipping data. Commissioning activities at the Corpus Christi liquefaction terminal in Texas continued last week as pipeline feedstock deliveries increased from 0.07 Bcf/d in the previous week to 0.4 Bcf-0.5 Bcf per day during the past few days. An LNG vessel that was expected to load the first Corpus Christi cargo loaded at Sabine Pass terminal instead. Currently, another tanker is en route to the Corpus Christi terminal to load the commissioning cargo, according to Bloomberg shipping data. U.S. LNG exports in November are on track to match or exceed the previous record set in July with 29 loaded cargoes through November 28 (25 from Sabine Pass and 4 from Cove Point). Net withdrawals are higher than the five-year average. Net withdrawals from storage totaled 59 Bcf for the week ending November 23, compared with the five-year (2013–17) average net withdrawals of 49 Bcf and last year's net withdrawals of 35 Bcf during the same week. Working gas stocks totaled 3,054 Bcf, which is 720 Bcf lower than the five-year average and 644 Bcf lower than last year at this time. Working gas stocks’ deficit to the five-year average increases while deficit to the bottom of the five-year range decreases. In the Lower 48 states, total working gas stocks are 372 Bcf lower than the five-year minimum, and every storage region is currently lower than the bottom of its five-year range. The deficit to the bottom of the range decreased in all regions except the South Central nonsalt region. As of this report week, the Midwest region is 57 Bcf (6%) lower than the five-year minimum, and the South Central region―including both salt and nonsalt facilities―is 154 Bcf (14%) lower than the five-year minimum. The average January 2019 futures contract price is trading at a discount to the average spot price, which provides incentive for storage withdrawals. Price differences between the spot price and the futures price at the Nymex indicate economic incentives for withdrawals from working gas. 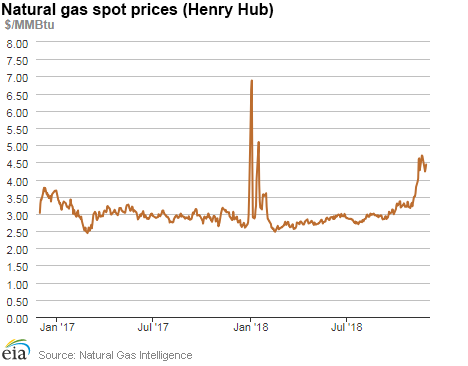 During the most recent storage week, the average natural gas spot price at the Henry Hub averaged $4.56/MMBtu, and the Nymex futures price of natural gas for delivery in January 2019 averaged $4.50/MMBtu, 6¢/MMBtu lower than the spot price. A year ago, the January contract was 10¢/MMBtu higher than the spot price. Reported net withdrawals into storage are slightly lower than the range of analysts’ expectations. According to The Desk survey of natural gas analysts, estimates of the weekly net change from working natural gas stocks ranged from net injections of 60 Bcf to 88 Bcf, with a median estimate of 70 Bcf. At the 10:30 a.m. release of the Weekly Natural Gas Storage Report, the price of the Nymex futures contract for November delivery at the Henry Hub fell 6¢/MMBtu to $4.48/MMBtu, with 421 trades executed. The price varied in subsequent trading, falling further to $4.46/MMBtu. Temperatures are lower than normal for the storage week. Temperatures in the Lower 48 states averaged 41 degrees Fahrenheit (°F), 4°F lower than normal and 6°F lower than last year at this time. Temperatures were 1°F higher than those reported for the previous week.